26:1.10 The individual members of the angelic orders are not altogether stationary as to personal status in the universe. Angels of certain orders may become Paradise Companions for a season; some become Celestial Recorders; others ascend to the ranks of the Technical Advisers. Certain of the cherubim may aspire to seraphic status and destiny, while evolutionary seraphim can achieve the spiritual levels of the ascending Sons of God. 26:1.15 All orders of the angelic hosts are devoted to the various universe services, and they minister in one way or another to the higher orders of celestial beings; but it is the supernaphim, seconaphim, and seraphim who, in large numbers, are employed in the furtherance of the ascending scheme of progressive perfection for the children of time. Functioning in the central, super-, and local universes, they form that unbroken chain of spirit ministers which has been provided by the Infinite Spirit for the help and guidance of all who seek to attain the Universal Father through the Eternal Son. 26:1.16 Supernaphim are limited in “spirit polarity” regarding only one phase of action, that with the Universal Father. They can work singly except when directly employing the exclusive circuits of the Father. When they are in power reception on the Father’s direct ministry, supernaphim must voluntarily associate in pairs to be able to function. Seconaphim are likewise limited and in addition must work in pairs in order to synchronize with the circuits of the Eternal Son. Seraphim can work singly as discrete and localized personalities, but they are able to encircuit only when polarized as liaison pairs. When such spirit beings are associated as pairs, the one is spoken of as complemental to the other. Complemental relationships may be transient; they are not necessarily of a permanent nature. 26:1.17 These brilliant creatures of light are sustained directly by the intake of the spiritual energy of the primary circuits of the universe. Urantia mortals must obtain light-energy through the vegetative incarnation, but the angelic hosts are encircuited; they “have food that you know not.” They also partake of the circulating teachings of the marvelous Trinity Teacher Sons; they have a reception of knowledge and an intake of wisdom much resembling their technique of assimilating the life energies. 26:2.2Primary supernaphim are the exclusive offspring of the Conjoint Creator. They divide their ministry about equally between certain groups of the Paradise Citizens and the ever-enlarging corps of ascendant pilgrims. These angels of the eternal Isle are highly efficacious in furthering the essential training of both groups of Paradise dwellers. They contribute much that is helpful to the mutual understanding of these two unique orders of universe creatures—the one being the highest type of divine and perfect will creature, and the other, the perfected evolution of the lowest type of will creature in all the universe of universes. 26:2.4Secondary supernaphim are the directors of the affairs of ascending beings on the seven circuits of Havona. They are equally concerned in ministering to the educational training of numerous orders of Paradise Citizens who sojourn for long periods on the world circuits of the central creation, but we may not discuss this phase of their service. 26:2.7Tertiary supernaphim take origin in these Seven Spirits of the Circuits. Each one of them, on the separate Havona circles, is empowered by the Infinite Spirit to create a sufficient number of high superaphic ministers of the tertiary order to meet the needs of the central universe. While the Circuit Spirits produced comparatively few of these angelic ministers prior to the arrival in Havona of the pilgrims of time, the Seven Master Spirits did not even begin the creation of secondary supernaphim until the landing of Grandfanda. As the older of the two orders, the tertiary supernaphim will therefore receive first consideration. 26:3.1 These servants of the Seven Master Spirits are the angelic specialists of the various circuits of Havona, and their ministry extends to both the ascending pilgrims of time and the descending pilgrims of eternity. On the billion study worlds of the perfect central creation, your superaphic associates of all orders will be fully visible to you. There you will all be, in the highest sense, fraternal and understanding beings of mutual contact and sympathy. You will also fully recognize and exquisitely fraternize with the descending pilgrims, the Paradise Citizens, who traverse these circuits from within outward, entering Havona through the pilot world of the first circuit and proceeding outward to the seventh. 26:3.2 The ascending pilgrims from the seven superuniverses pass through Havona in the opposite direction, entering by way of the pilot world of the seventh circuit and proceeding inward. There is no time limit set on the progress of the ascending creatures from world to world and from circuit to circuit, just as no fixed span of time is arbitrarily assigned to residence on the morontia worlds. But, whereas adequately developed individuals may be exempted from sojourn on one or more of the local universe training worlds, no pilgrim may avoid passing through all seven of the Havona circuits of progressive spiritualization. 26:3.4 1. The Harmony Supervisors. It must be apparent that some sort of co-ordinating influence would be required, even in perfect Havona, to maintain system and to insure harmony in all the work of preparing the pilgrims of time for their subsequent Paradise achievements. Such is the real mission of the harmony supervisors—to keep everything moving along smoothly and expeditiously. Originating on the first circuit, they serve throughout Havona, and their presence on the circuits means that nothing can possibly go amiss. A great ability to co-ordinate a diversity of activities involving personalities of differing orders—even multiple levels—enables these supernaphim to give assistance wherever and whenever required. They contribute enormously to the mutual understanding of the pilgrims of >time and the pilgrims of eternity. 26:3.5 2. The Chief Recorders. These angels are created on the second circuit but operate everywhere in the central universe. They record in triplicate, executing records for the literal files of Havona, for the spiritual files of their order, and for the formal records of Paradise. In addition they automatically transmit the transactions of true-knowledge import to the living libraries of Paradise, the custodians of knowledge of the primary order of supernaphim. 26:3.6 3. The Broadcasters. The children of the third Circuit Spirit function throughout Havona, although their official station is located on planet number seventy in the outermost circle. These master technicians are the broadcast receivers and senders of the central creation and the directors of the space reports of all Deity phenomena on Paradise. They can operate all of the basic circuits of space. 26:3.7 4. The Messengers take origin on circuit number four. They range the Paradise-Havona system as bearers of all messages requiring personal transmission. They serve their fellows, the celestial personalities, the Paradise pilgrims, and even the ascendant souls of time. 26:3.8 5. The Intelligence Co-ordinators. These tertiary supernaphim, the children of the fifth Circuit Spirit, are always the wise and sympathetic promoters of fraternal association between the ascending and the descending pilgrims. They minister to all the inhabitants of Havona, and especially to the ascenders, by keeping them currently informed regarding the affairs of the universe of universes. By virtue of personal contacts with the broadcasters and the reflectors, these “living newspapers” of Havona are instantly conversant with all information passing over the vast news circuits of the central universe. They secure intelligence by the Havona graph method, which enables them automatically to assimilate as much information in one hour of Urantia time as would require a thousand years for your most rapid telegraphic technique to record. 26:3.9 6. The Transport Personalities. These beings, of origin on circuit number six, usually operate from planet number forty in the outermost circuit. It is they who take away the disappointed candidates who transiently fail in the Deity adventure. They stand ready to serve all who must come and go in the service of Havona, and who are not space traversers. 26:3.10 7. The Reserve Corps. The fluctuations in the work with the ascendant beings, the Paradise pilgrims, and other orders of beings sojourning in Havona, make it necessary to maintain these reserves of supernaphim on the pilot world of the seventh circle, where they take origin. They are created without special design and are competent to take up service in the less exacting phases of any of the duties of their superaphic associates of the tertiary order. 26:4.10 Each of these working groups contains angels of all seven created types, and a pilgrim of space is always tutored by secondary supernaphim of origin in the Master Spirit who presides over that pilgrim’s superuniverse of nativity. When you mortals of Urantia attain Havona, you will certainly be piloted by supernaphim whose created natures—like your own evolved natures—are derived from the Master Spirit of Orvonton. And since your tutors spring from the Master Spirit of your own superuniverse, they are especially qualified to understand, comfort, and assist you in all your efforts to attain Paradise perfection. 26:4.11 The pilgrims of time are transported past the dark gravity bodies of Havona to the outer planetary circuit by the transport personalities of the primary order of seconaphim, operating from the headquarters of the seven superuniverses. 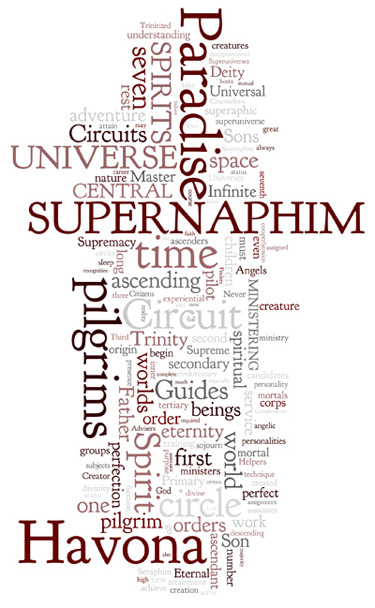 A majority, but not all, of the seraphim of planetary and local universe service who have been accredited for the Paradise ascent will part with their mortal associates before the long flight to Havona and will at once begin a long and intense training for supernal assignment, expecting to achieve, as seraphim, perfection of existence and supremacy of service. And this they do, hoping to rejoin the pilgrims of time, to be reckoned among those who forever follow the course of such mortals as have attained the Universal Father and have received assignment to the undisclosed service of the Corps of the Finality. 26:4.12 The pilgrim lands on the receiving planet of Havona, the pilot world of the seventh circuit, with only one endowment of perfection, perfection of purpose. The Universal Father has decreed: “Be you perfect, even as I am perfect.” That is the astounding invitation-command broadcast to the finite children of the worlds of space. The promulgation of that injunction has set all creation astir in the co-operative effort of the celestial beings to assist in bringing about the fulfillment and realization of that tremendous command of the First Great Source and Center. 26:4.13 When, through and by the ministry of all the helper hosts of the universal scheme of survival, you are finally deposited on the receiving world of Havona, you arrive with only one sort of perfection—perfection of purpose. Your purpose has been thoroughly proved; your faith has been tested. You are known to be disappointment proof. Not even the failure to discern the Universal Father can shake the faith or seriously disturb the trust of an ascendant mortal who has passed through the experience that all must traverse in order to attain the perfect spheres of Havona. By the time you reach Havona, your sincerity has become sublime. Perfection of purpose and divinity of desire, with steadfastness of faith, have secured your entrance to the settled abodes of eternity; your deliverance from the uncertainties of >time is full and complete; and now must you come face to face with the problems of Havona and the immensities of Paradise. to meet which you have so long been in training in the experiential epochs of time on the world schools of space. 26:4.14 Faith has won for the ascendant pilgrim a perfection of purpose which admits the children of time to the portals of eternity. Now must the pilgrim helpers begin the work of developing that perfection of understanding and that technique of comprehension which are so indispensable to Paradise perfection of personality. 26:4.15Ability to comprehend is the mortal passport to Paradise. Willingness to believe is the key to Havona. The acceptance of sonship, co-operation with the indwelling Adjuster, is the price of evolutionary survival. 26:5.1 The first of the seven groups of secondary supernaphim to be encountered are the pilgrim helpers, those beings of quick understanding and broad sympathy who welcome the much-traveled ascenders of space to the stabilized worlds and settled economy of the central universe. Simultaneously these high ministers begin their work for the Paradise pilgrims of eternity, the first of whom arrived on the pilot world of the inner Havona circuit concomitantly with the landing of Grandfanda on the pilot world of the outer circuit. Back in those far-distant days the pilgrims from Paradise and the pilgrims of time first met on the receiving world of circuit number four. 26:5.2 These pilgrim helpers, functioning on the seventh circle of Havona worlds, conduct their work for the ascending mortals in three major divisions: first, the supreme understanding of the Paradise Trinity; second, the spiritual comprehension of the Father-Son partnership; and third, the intellectual recognition of the Infinite Spirit. Each of these phases of instruction is divided into seven branches of twelve minor divisions of seventy subsidiary groups; and each of these seventy subsidiary groupings of instruction is presented in one thousand classifications. More detailed instruction is provided on subsequent circles, but an outline of every Paradise requirement is taught by the pilgrim helpers. 26:5.4 There is a definite requirement of the pilgrims of time on each of the Havona circles; and while every pilgrim continues under the tutelage of supernaphim by nature adapted to helping that particular type of ascendant creature, the course that must be mastered is fairly uniform for all ascenders who reach the central universe. This course of achievement is quantitative, qualitative, and experiential—intellectual, spiritual, and supreme. 26:5.5 Time is of little consequence on the Havona circles. In a limited manner it enters into the possibilities of advancement, but achievement is the final and supreme test. The very moment your superaphic associate deems you to be competent to pass inward to the next circle, you will be taken before the twelve adjutants of the seventh Circuit Spirit. Here you will be required to pass the tests of the circle determined by the superuniverse of your origin and by the system of your nativity. The divinity attainment of this circle takes place on the pilot world and consists in the spiritual recognition and realization of the Master Spirit of the ascending pilgrim’s superuniverse. 26:5.6 When the work of the outer Havona circle is finished and the course presented is mastered, the pilgrim helpers take their subjects to the pilot world of the next circle and commit them to the care of the supremacy guides. The pilgrim helpers always tarry for a season to assist in making the transfer both pleasant and profitable. 26:6.1 Ascenders of space are designated “spiritual graduates” when translated from the seventh to the sixth circle and are placed under the immediate supervision of the supremacy guides. These guides should not be confused with the Graduate Guides—belonging to the Higher Personalities of the Infinite Spirit—who, with their servital associates, minister on all circuits of Havona to both ascending and descending pilgrims. The supremacy guides function only on the sixth circle of the central universe. 26:6.2 It is in this circle that the ascenders achieve a new realization of Supreme Divinity. Through their long careers in the evolutionary universes the pilgrims of time have been experiencing a growing awareness of the reality of an almighty overcontrol of the time-space creations. Here, on this Havona circuit, they come near to encountering the central universe source of time-space unity —the spiritual reality of God the Supreme. 26:7.1 Trinity guides are the tireless ministers of the fifth circle of the Havona training of the advancing pilgrims of time and space. The spiritual graduates are here designated “candidates for the Deity adventure” since it is on this circle, under the direction of the Trinity guides, that the pilgrims receive advanced instruction concerning the divine Trinity in preparation for the attempt to achieve the personality recognition of the Infinite Spirit. And here the ascending pilgrims discover what true study and real mental effort mean as they begin to discern the nature of the still-more-taxing and far-more-arduous spiritual exertion that will be required to meet the demands of the high goal set for their achievement on the worlds of this circuit. 26:7.2 Most faithful and efficient are the Trinity guides; and each pilgrim receives the undivided attention, and enjoys the whole affection, of a secondary supernaphim belonging to this order. Never would a pilgrim of time find the first approachable person of the Paradise Trinity were it not for the help and assistance of these guides and the host of other spiritual beings engaged in instructing the ascenders respecting the nature and technique of the forthcoming Deity adventure. 26:7.3 After the completion of the course of training on this circuit the Trinity guides take their pupils to its pilot world and present them before one of the many triune commissions functioning as examiners and certifiers of candidates for the Deity adventure. These commissions consist of one fellow of the finaliters, one of the directors of conduct of the order of primary supernaphim, and either a Solitary Messenger of space or a Trinitized Son of Paradise. 26:7.4 When an ascendant soul actually starts for Paradise, he is accompanied only by the transit trio: the superaphic circle associate, the Graduate Guide, and the ever-present servital associate of the latter. These excursions from the Havona circles to Paradise are trial trips; the ascenders are not yet of Paradise status. They do not achieve residential status on Paradise until they have passed through the terminal rest of time subsequent to the attainment of the Universal Father and the final clearance of the Havona circuits. Not until after the divine rest do they partake of the “essence of divinity” and the “spirit of supremacy” and thus really begin to function in the circle of eternity and in the presence of the Trinity. 26:7.5 The ascender’s companions of the transit trio are not required to enable him to locate the geographic presence of the spiritual luminosity of the Trinity, rather to afford all possible assistance to a pilgrim in his difficult task of recognizing, discerning, and comprehending the Infinite Spirit sufficiently to constitute personality recognition. Any ascendant pilgrim on Paradise can discern the geographic or locational presence of the Trinity, the great majority are able to contact the intellectual reality of the Deities, especially the Third Person, but not all can recognize or even partially comprehend the reality of the spiritual presence of the Father and the Son. Still more difficult is even the minimum spiritual comprehension of the Universal Father. 26:7.6 Seldom does the quest for the Infinite Spirit fail of consummation, and when their subjects have succeeded in this phase of the Deity adventure, the Trinity guides prepare to transfer them to the ministry of the Son finders on the fourth circle of Havona. 26:8.1 The fourth Havona circuit is sometimes called the “circuit of the Sons.” From the worlds of this circuit the ascending pilgrims go to Paradise to achieve an understanding contact with the Eternal Son, while on the worlds of this circuit the descending pilgrims achieve a new comprehension of the nature and mission of the Creator Sons of time and space. There are seven worlds in this circuit on which the reserve corps of the Paradise Michaels maintain special service schools of mutual ministry to both the ascending and descending pilgrims; and it is on these worlds of the Michael Sons that the pilgrims of time and the pilgrims of eternity arrive at their first truly mutual understanding of one another. In many respects the experiences of this circuit are the most intriguing of the entire Havona sojourn. 26:8.3 After the attainment of the Infinite Spirit, no more examinations are conducted. The tests of the inner circles are the performances of the pilgrim candidates when in the embrace of the enshroudment of the Deities. Advancement is determined purely by the spirituality of the individual, and no one but the Gods presumes to pass upon this possession. In the event of failure no reasons are ever assigned, neither are the candidates themselves nor their various tutors and guides ever chided or criticized. On Paradise,disappointment is never regarded as defeat; postponement is never looked upon as disgrace; the apparent failures of time are never confused with the significant delays of eternity. 26:9.1 When the pilgrim soul attains the third circle of Havona, he comes under the tutelage of the Father guides, the older, highly skilled, and most experienced of the superaphic ministers. On the worlds of this circuit the Father guides maintain schools of wisdom and colleges of technique wherein all the beings inhabiting the central universe serve as teachers. Nothing is neglected which would be of service to a creature of time in this transcendent adventure of eternity attainment. 26:9.2 The attainment of the Universal Father is the passport to eternity, notwithstanding the remaining circuits to be traversed. It is therefore a momentous occasion on the pilot world of circle number three when the transit trio announce that the last venture of time is about to ensue; that another creature of space seeks entry to Paradise through the portals of eternity. 26:9.4 Step by step, life by life, world by world, the ascendant career has been mastered, and the goal of Deity has been attained. Survival is complete in perfection, and perfection is replete in the supremacy of divinity. Time is lost in eternity; space is swallowed up in worshipful identity and harmony with the Universal Father. The broadcasts of Havona flash forth the space reports of glory, the good news that in very truth the conscientious creatures of animal nature and material origin have, through evolutionaryascension, become in reality and eternally the perfected sons of God. 26:11.1 Much of an ascender’s time on the last circuit is devoted to a continuation of the study of the impending problems of Paradise residence. A vast and diverse host of beings, the majority unrevealed, are permanent and transient residents of this inner ring of Havona worlds. And the commingling of these manifold types provides the superaphic complements of rest with a rich situational environment which they effectively utilize in furthering the education of the ascending pilgrims, especially with regard to the problems of adjustment to the many groups of beings soon to be encountered on Paradise.